I have been on a new found mission lately to find low calorie yet tasty dinners. I have gone on this mission before only to be sadly disappointed with the results. Last night, however, this restored my faith that good food can taste good...really good! This dish is light yet profoundly flavorful. Arugula is typically bitter, but in this dish it really balances out the vinegar and nuttiness of the cheese, so whatever you do, don't skip it! I strongly suggest splurging and getting a good pecorino ramono for the utmost flavor, but in all honestly it would probably be just as good with a cheap parmesan. If you're looking for a vegetarian option of this dish, skip the shrimp! I must admit, for not really having a "sauce" and it being pasta dish, I wasn't all that convinced I would love it but it was a wonderful surprise, (and I love good surprises!) Not only is it healthy but it was really easy to make. All in all, dinner was on the table in 20 minutes. You have to love that... right? Bring a large pot of water to a boil. Cook ravioli until tender, 7 to 9 minutes or according to package directions. Drain well and set aside in strainer. Meanwhile, heat oil in a small skillet over medium heat. Mash garlic into a paste with the side of a chef’s knife and add to pan. Next, add sliced the shallots and cook, stirring often, until just starting to brown, 3 to 4 minutes. Stir in vinegar, mustard, salt, and pepper and stir together until combined well. Add shrimp and cook about 3 minutes or until shrimp are pink in color. 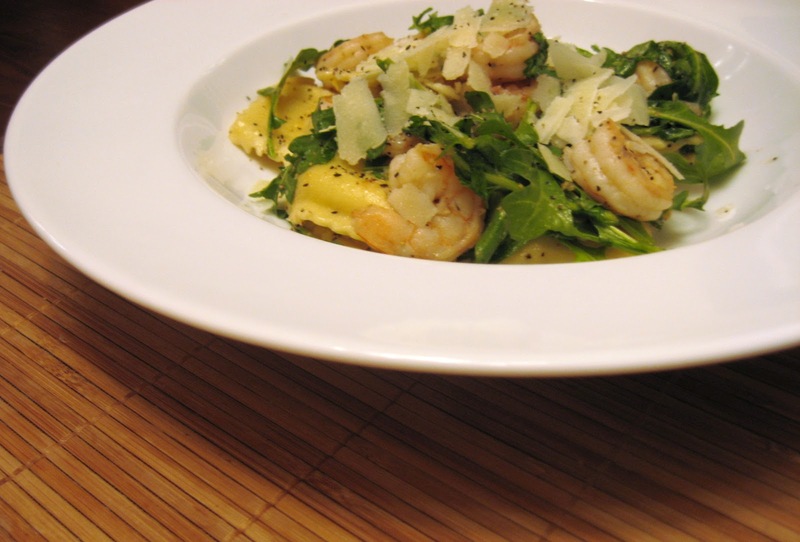 Place the ravioli and arugula in a large bowl and toss with the shrimp and pan dressing. Sprinkle with shaved pecorino and serve while hot. Pretty easy, right? Hope you enjoy it as much as I did.